Metal Hose Assembly Installation - Ontario Hose Specialties Limited. Corrugated hose is engineered to provide maximum service life when properly installed. 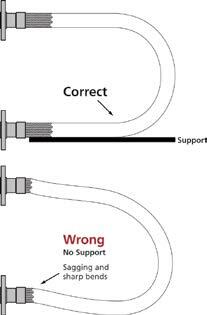 Improper installation, incorrect flexing or careless handling in an application will reduce the effective service life of the hose and cause premature failure of an assembly. The following installation and handling precautions should be observed to achieve optimum performance from your corrugated hose assemblies. 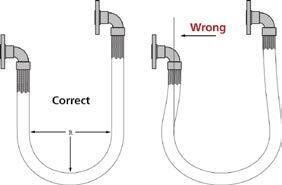 Do not twist hose assembly during installation when aligning the bolt holes in a flange or in making up pipe threads. 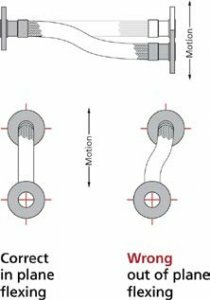 The utilization of lap joint flanges or pipe unions will minimize this condition. It is recommended that two wrenches be used in making the union connections; one to prevent the hose from twisting and the other to tighten the coupling. Prevent out-of-plane flexing in an installation. Always install the hose so that the flexing takes place in only one plane. This plane must be the plane in which the bending occurs. 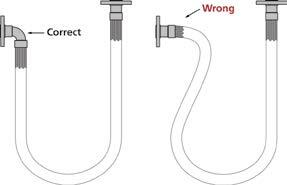 When installing the assembly in a horizontal loop, provide support for the arms to prevent the hose from sagging. 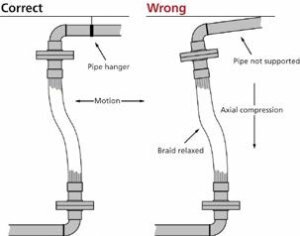 The repetitive bending of a hose to a radius smaller than the radius listed in the specification tables for corrugated hose will result in premature hose failure. Always provide sufficient length to prevent over bending and to eliminate strain on the hose. Utilize sound geometric configurations that avoid sharp bends, especially near the end fittings of the assembly.